In the upper left hand corner of the map, you are able to zoom in and out, lock the map in place, and select an area of data points. When you select data points you are able to filter based on that selection. The state filter allows you to filter down to an individual state. As long as the map hasn’t been locked, both visualizations will then adjust to this selection. If you have an interest in a particular county you are able to find it here. Selecting a county using this filter will remove all other counties and allow you to focus directly on the point of interest. The data for this visualization comes from the American Community Survey with is conducted by the United States Census Bureau. 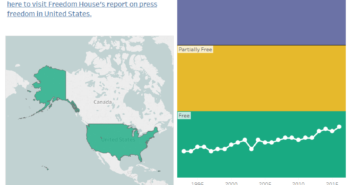 The data set can be found at http://factfinder.census.gov. It is labeled, Median Gross Rent (Dollars), Table B25064. 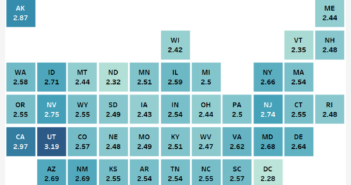 The 2010-2014 5 year estimates were used in an effort to provide information on every county. The visualization is representative of data collected in that time period. Once the data was downloaded it was manipulated in Microsoft Excel. Once it was in a usable form, it was loaded into Tableau where I rendered the visualizations and added filters. 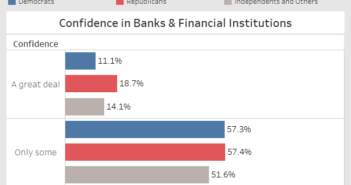 How does confidence in U.S. institutions differ by political party preference?